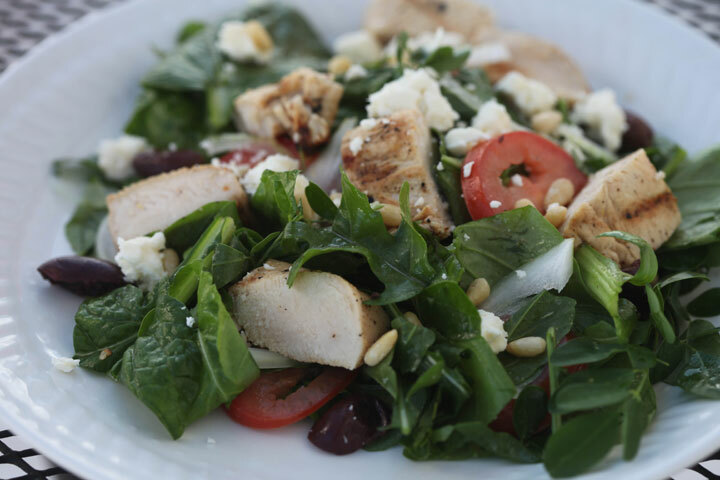 We’re eating a greek salad filled with local mixed greens, grilled lemon-truffle marinated chicken tenderloins, crumbled feta, roma tomatoes, toasted pine nuts, kalamata olives, and a lemon-feta vinaigrette. A little over a year ago I wrote piece about my weight loss journey and how I was about to begin the project of writing a low-cal cookbook… then life happened. I was new to the tiny Caribbean town of Rincon, Puerto Rico and instead of working on the book, I worked on enjoying life. 2012 was filled with tons of fun in the sun (and water), great comida criolla, and perhaps one too many Medallas. Since that post in October 2011 I’ve gained back about 11 of the 110 pounds I’d lost and, for me, that’s just not acceptable. I worked far too hard to shed that weight to allow it to creep back on. One of the things that I would remind myself during workouts was that I didn’t want to become a statistic. (I read somewhere that if you can stick with a workout routine for 6 months straight without any breaks the routine was more likely to stick – so thus for the first 6 months of working out, I refused to miss a workout… and guess what! It actually worked. I still workout at least three or four times a week.) Anyway, in the same way I didn’t want to become a statistic to not keeping a workout regime, I don’t want to be a statistic with my weight loss. For so many people who have shed a hundred pounds, a large percentage have gained at least a bit of that weight back. I don’t want that to happen and it’s solely up to me to nip that in the bud! 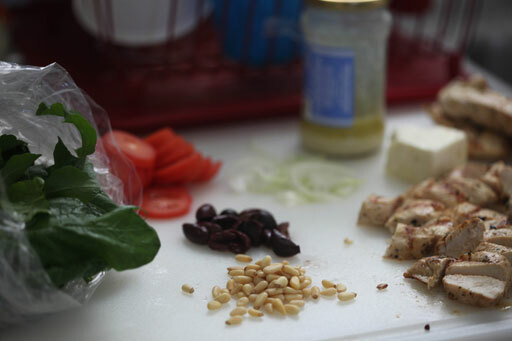 The grilled chicken tenderloin recipe that I posted earlier this week, as well as this salad/vinaigrette are a part of my attempt to eat healthier in this New Year and into the future. I’m back to counting calories and back to restricting my alcohol intake a bit (comes with the calorie counting and I know my liver will thank me)! 😉 I hope you guys had an amazing holiday season! Did anyone else reflect on where they’ve been and where they’d like to progress towards during the turn of the New Year? What were your New Years resolutions for 2013?!? Thanks for the lighter recipes to start the new year! I don’t really do resolutions, but try every year to continue to lead a healthy lifestyle. Having lost 40 pounds, which is a lot for my 4’10” frame, I know how you feel about not wanting to be one of the statistics that puts it back on. I count calories when I need to keep myself in check or shed a few holiday pounds, like now. I use My Fitness Pal, a great website/app for tracking calories and exercise. If you are on there, feel free to look me up. Good luck and know you’re not alone! Wow, you lost 110 lbs, that is incredible. So inspirational that you are not going let that weight creep back on, and get back on track to get those 11 lbs off.